They may be small, but they’ve got a big responsibility! The function of carabiners is your security. In order to trust a carabiner, it is important to pay attention to the given specifications for this piece of so-called ‚Personal Protection Equipment‘ (PPE). These specifications ensure that the certifications and the material testing are consistent. Before a new carabiner is brought out on the market, even the smallest details are tested both internally and externally. The external testing institute, in our case the AUVA (from German, Allgemeine Unfallversicherungsanstalt) in Vienna, confirms that climbers, flyers, industry climbers and work safety experts can trust our carabiners. The form and feel of a carabiner should also be considered: how the carabiner subjectively feels in your hand and if it is comfortable to open and close. There are many different preferences for carabiners, and there are as many different shapes and sizes. What is perfect for one, may not work for the other. The correct carabiner certifications shouldn’t be a criterion for purchasing, it should go without saying that whatever carabiner you buy meets the standards. Unfortunately, this is not always the case. Many traditional manufacturers are forced to close, or to outsource to countries with cheaper labour. There, the produces are produced cheaply, making the product more competitive on the market. However, in such cases, the certification of the carabiners to the standards is not always guaranteed. >> Indication of the manufacturer. >> Indication of the carabiner type, according to EN 12275 (the sport climbing carabiner norm): H for HMS, X for Oval and K for Via Ferrata (Klettersteig). If none of these types are indicated, it is a type-B carabiner – ‚B‘ for Basis. >> Minimum strength rating in Kilo Newtons (kN), rounded down to the next round number. Here the breaking load is given when the load is applied lengthwise (major axis), sideways (minor axis) and along the major axis when the gate is open. 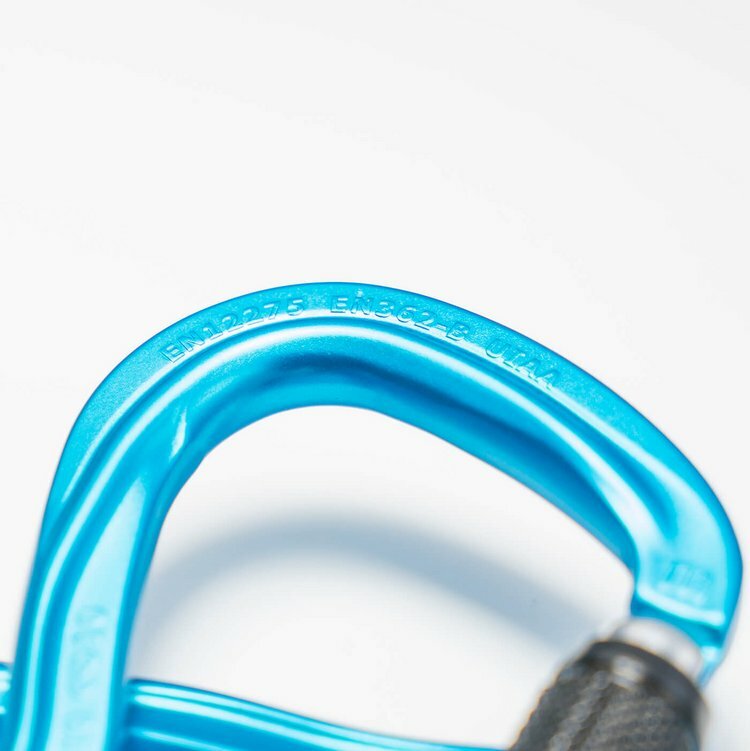 >> The orginal ‚ce‘ marking, confirming that the carabiner meets the industry standards. Caution: Ensure that this is the correct marking. ‘ce’ can also stand for ‚China Export‘. Directly following ‘ce‘ a 4 digit ID number must be printed, in our case 0511 indicating the AUVA in Vienna. In addition to the ce -norm, it is possible to have the specification of the UIAA. Although the UIAA norm equates, in principle, to the ce -norm, in most cases the UIAA requires higher values or additional tests. The UIAA norms are always stricter than the ce, thus it is not possible to have a UIAA indication without a ce indication. If UIAA is indicated, so is ce. WHO IS BEHIND THESE ORGANIZATIONS? The CEN (European Committee for Standardization) is a European organization present in all areas of daily life. From baby changing tables to safes to thermal solar panels, the CEN ensures that these products meet minimum safety requirements. The UIAA is the parent organization of all Alpine Clubs (International Mountaineering and Climbing Federation). Next to the Safcom (Safety Commission) they are engaged in many areas of climbing, for example, in the international youth employment. As well, they are the home of the Ice climbing world cups. 100% of carabiners, ice tools, crampons, and hardware manufactured by AUTRIAPLIN are produced in Fulpmes in the Stubai Valley, near to Innsbruck, Tirol. It is extremely important for us to ensure local jobs, and to conserve the environment. As Austria is a country which values strict ecological standards, there are particularly strict requirements and constraints in the manufacturing and refining process. However, for us, the environment and the security of the future generations are worth the higher costs. >> An additional important consideration is the lock. Here it’s important how fluid the lock is. Our screw gate locks are made from steel or brass. Both work very well with aluminIum; brass particularly well. 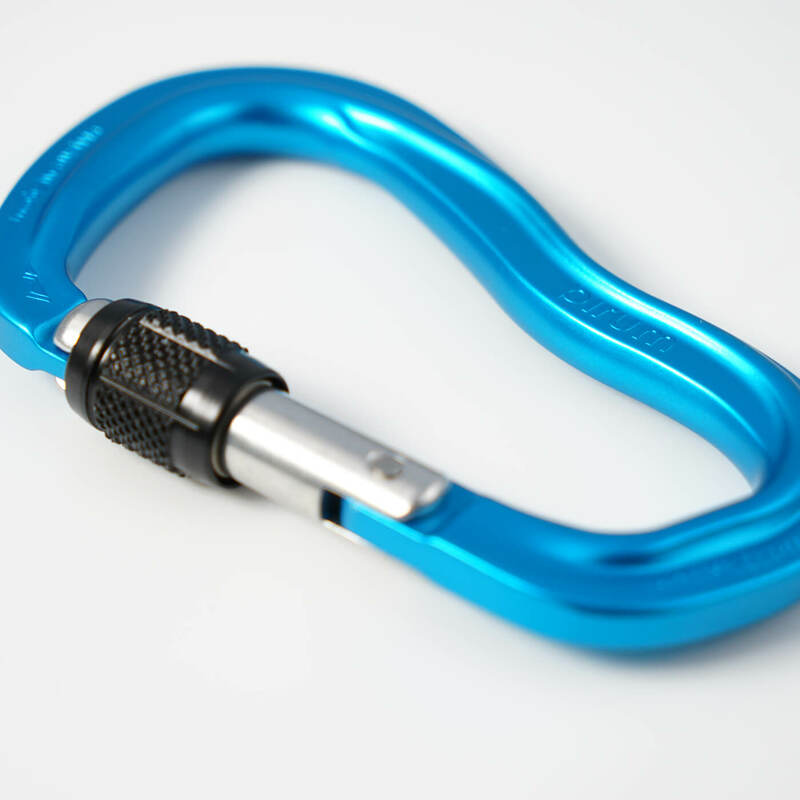 Our lock mechanism distinguishes itself from the rest of the carabiner with a special colour. >> A standard feature for many different AUSTRIALPIN carabiners is the GATE RED indication on the gate of the carabiner, as well as the individual ID number (ID) on the back of the carabiner. 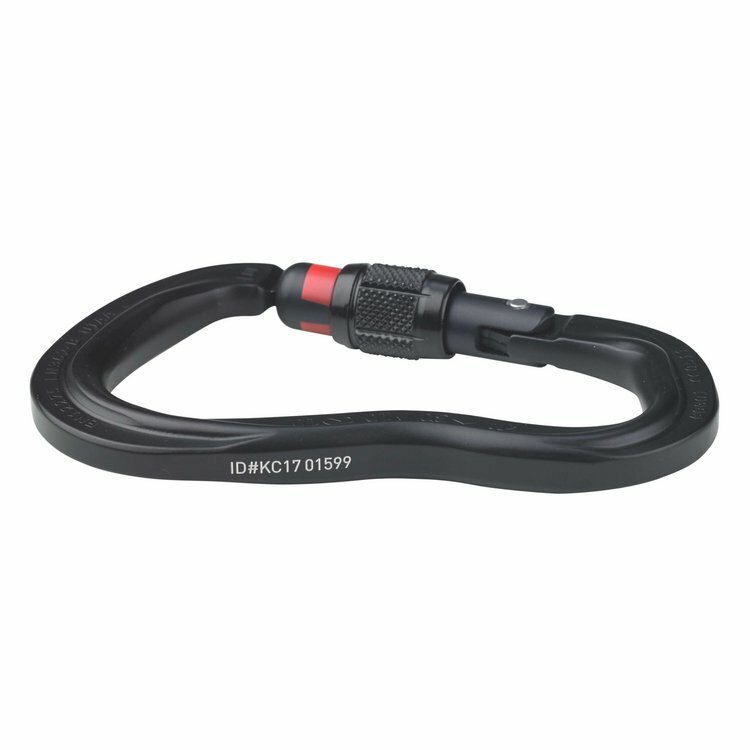 All carabiners including these two functions are indicated by -GI or -ID after the respective article numbers. >> New carabiners shouldn’t have any sharp corners or edges: These will damage any textile parts of your gear, just like sharp rock can damage your rope. The same is true for all riveting. The smoother the surface, the better for the material. As well, normally all textile pieces of gear have a shorter life than metal pieces. 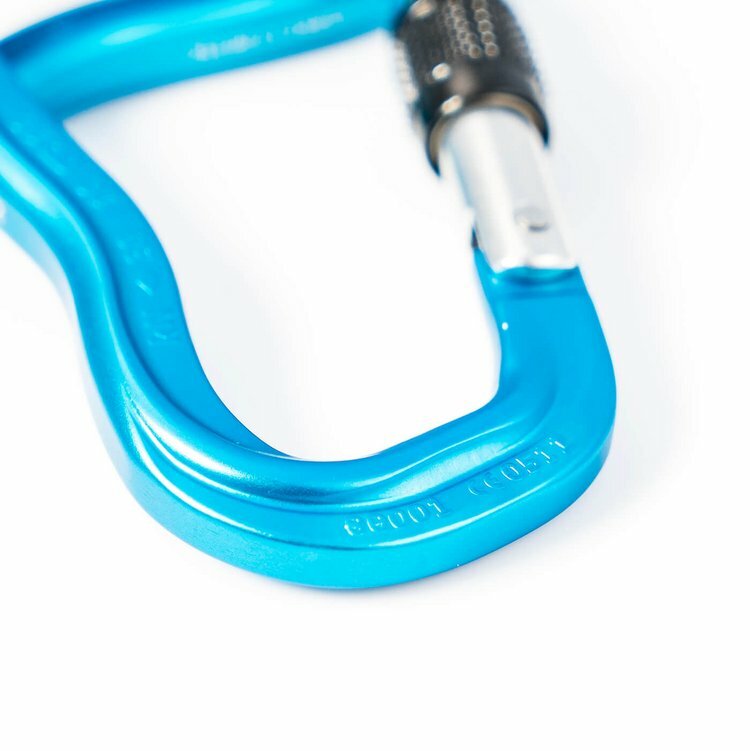 Most of our aluminum carabiners are anodized for increased durability. This is done by placing the carabiners in an anodizing bath containing sulfuric acid. 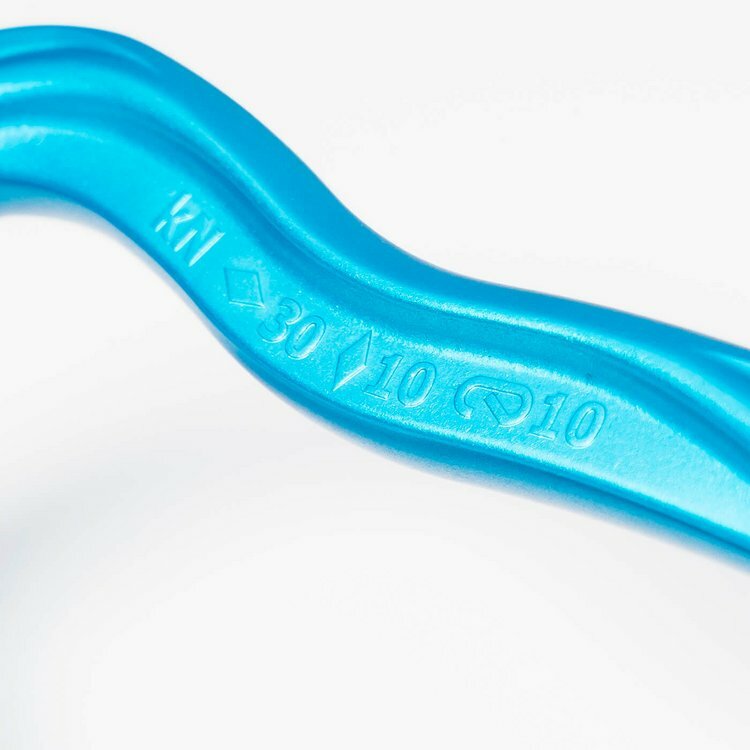 Applying a current to the bath results in a chemical reaction in the aluminum of the carabiner. The outermost layer of aluminum will oxidize, making it especially robust against scratches as well as protecting the carabiner from corrosion. Again, here we take the more expensive route: the anodization of the entire product palette is carried out in Austria. The sulfuric acid bath has to be properly disposed of, where it can be neutralized. Up to 90% of the resulting material can be delivered to a sewage plant. There it can be used as a ‚precipitant‘, cleaning drain water of excessive phosphates.